Texas may be well known for oil and cattle, but in this part of the state the principal activity is growing cotton. The concept of bringing in additional jobs, and revenue, to the region with wind power projects was welcomed. The developer of the Roscoe/Champion wind farm projects in Texas, E.ON Climate and Renewables, is working on the final two phases of the projects which-when fully developed and completed-will have a staggering combined capacity of over 800 MW, and span four counties. As the developers of wind farm projects know only too well, plans can change as projects proceed-and the changes can often include a downward adjustment in a project's power capacity. Environmental considerations or community concerns may emerge, or the transmission capacity simply may not be sufficient. But E.ON Climate and Renewables (formerly Airtricity Inc.) found that wasn't the case with the company's Roscoe/Champion wind farm projects in Texas. "With a typical wind farm development, you always have big hopes and then you can have hurdles that knock the size or energy capacity down," says Patrick Woodson, vice-president of southwest U.S. development for E.ON Climate and Renewables. But with the Roscoe and Champion wind farms, it was the opposite. "We thought we would have a fairly modest-sized project, but the more we investigated, the more things fell into place. We realized we had more transmission capacity-a lot more-than what we originally expected. We found we had a lot more land than we thought we could originally acquire. And we have a very robust market that was hungry for a whole lot of power." The first two phases of the Roscoe and Champion projects are now completed, and construction is ongoing on the final two phases. When fully developed and completed, the projects will have a staggering combined capacity of over 800 MW, and span four counties. The Roscoe/Champion project site is in central Texas, near the town of Roscoe, about 45 miles southwest of Abilene. The site is unique in a few aspects, says Woodson. From north to south, there are five major transmission lines running across the site, which in itself is particularly unusual. "We're usually happy to find one good transmission line-and this site has an enormous amount of capacity running through it." The site also has very good, steady year round winds, averaging 18 mph. And of course, the State of Texas itself is very on side with wind power. "Texas has really created a very good regulatory climate that allows wind power projects that have minimal impact to get built very quickly," notes Woodson. Texas really has been among the pioneers in U.S. alternative energy. The state passed its first Renewable Portfolio Standard back in 1999 and expanded on it in 2005. State law now requires that 5,880 MW of new renewable generation be built by 2015, meeting about five percent of the state's projected electricity demand. The legislation also sets a cumulative target of installing 10,000 MW of renewable generation capacity by 2025. These kinds of legislative efforts at the state level have gone a long way to establishing the leadership position Texas now enjoys in wind power. Besides the general support of the state for wind power, Woodson notes there was considerable local support for the Roscoe and Champion projects. "We had a group of landowners who were very willing to have wind power on their property. The entire community was extremely receptive to the idea of creating this project." When you put all this together, if there was a list of attributes required to get the green light on these projects, they had pretty much all been checked off. Despite all the wind power development that Texas has seen in recent years, this particular site did not seem to be on anyone's radar screen, Woodson notes. Texas is probably the hottest market in the world right now for wind power, notes Patrick Woodson, vice-president of south west U.S. development for E.ON Climate and Renewables. The state saw 1,618 MW of new capacity installed in 2007, and that blistering pace shows no sign of slowing. "If you look back 10 years, we would have been happy to have 80 MW of installed wind power every couple of years. And I think right now we're expecting between 2,000 and 3,000 MW to come on line in 2008." Woodson has been involved with Texas wind power for a decade. His first project-Southwest Mesa-involved 75 MW and was the biggest wind project in the state at the time, in 1998. Now he's working on projects-Champion and Roscoe-that combined are ten times that. "We've seen some peaks and valleys in wind power over the years. 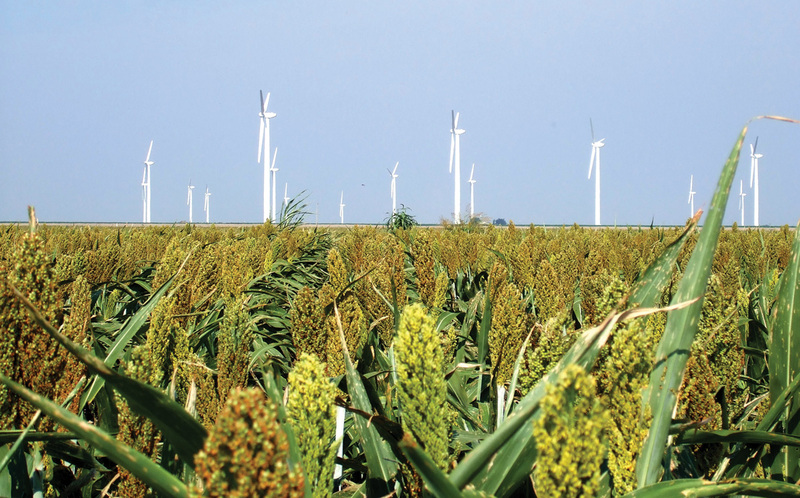 But there is no question this is far and away the golden age for Texas wind." They were using 750 kW turbines back then, and are now using 2.5 MW turbines. "It's amazing how much this industry has moved forward in such a short period of time." And, he adds, it's gratifying to see how many of the biggest wind power projects in the country are in Texas. In addition to Champion/Roscoe, there is FPL's Horse Hollow, Babcock & Brown's Sweetwater project and AES's Buffalo Gap. "It really is an amazing concentration of projects." The spinoffs are also happening. GE has set up a regional service center to service all the turbines they have working in the West Texas area, and more is to come. Driving the development is the state's RPS, and legislation supporting alternative energy. But there are also other factors at work. As part of a massive $45 billion buyout deal struck in 2007, TXU, the largest energy provider in Texas, promised environmental groups they would cancel a batch of coal-fired power plants and increase their focus on alternative energy, such as wind. E.ON Climate and Renewables is already providing power to TXU from the Champion and Forest Creek wind projects. "In many ways, this was kind of a forgotten site. Most of the original wind power projects in Texas have been done on large mesas and this did not seem to have any kind of similar topographical feel to it. Driving around the site, it feels like the flattest place around, but it is, in fact, on a large rise that is many miles long." Many people associate Texas with the oil and gas industry, and cattle farming, but in this part of the state the principal activity is growing cotton. The concept of bringing in non-agricultural jobs, and revenue, to the region was welcomed. Getting the landowners on side was key, especially considering the scope of the combined projects. When completed, the four phases of Roscoe/Champion will be located on a staggering 100,000 acres of land. The company had to deal with 126 landowners in the first two phases, and another 100 landowners in the last two phases. "There's no question that brings challenges," says Woodson. "The land work took on a much more robust part of our diligence and work. In the past, we had one development person per project. But the size of this project meant we ramped up our staffing in order to get things done on time." With these long established farms, there was an existing road network that E.ON Climate and Renewables was able to tap into, though Woodson notes the company still had to build a significant amount of road. "The way it works in this area is that many of the farms were organized in half-mile or mile blocks, and there are public roads about every mile, with breaks built so that farm equipment could be turned around." Among the first things E.ON Climate and Renewables did was carry out an extensive array of environmental studies, including for avian and cultural resources. These studies were carried out by Blanton and Associates. "We also look at the impact on wetlands on pretty much every site we have," Woodson says. It's a crucial part of providing information to the local community, and it also keeps the investment community happy. As noted, they were actually able to increase the size of the projects as planning proceeded-which was a surprise to just about everybody. "If I have another project like this in my career, I'd be surprised," says Woodson. "It's been a dream project. We have a phenomenal resource, great transmission and no serious environmental impediments. It's the right project, in the right place, at the right time. And we're extremely excited to be part of it." The first phase of the Roscoe wind farm is 209 megawatts, employing 209 1.0 MW Mitsubishi 1000A turbines. The 126 MW Champion project is adjacent to the Roscoe site, and involved using 2.3 MW Siemens units. E.ON Climate and Renewables-when it was Airtricity-used the Siemens units on its first U.S. project, at Forest Creek, also in Texas. It marks the first time they have used Mitsubishi turbines, but Woodson notes they have been used on other projects in Texas. "We feel very comfortable with our equipment choices." The final two phases of the project involve using additional Mitsubishi 1000A turbines as well as GE turbines. 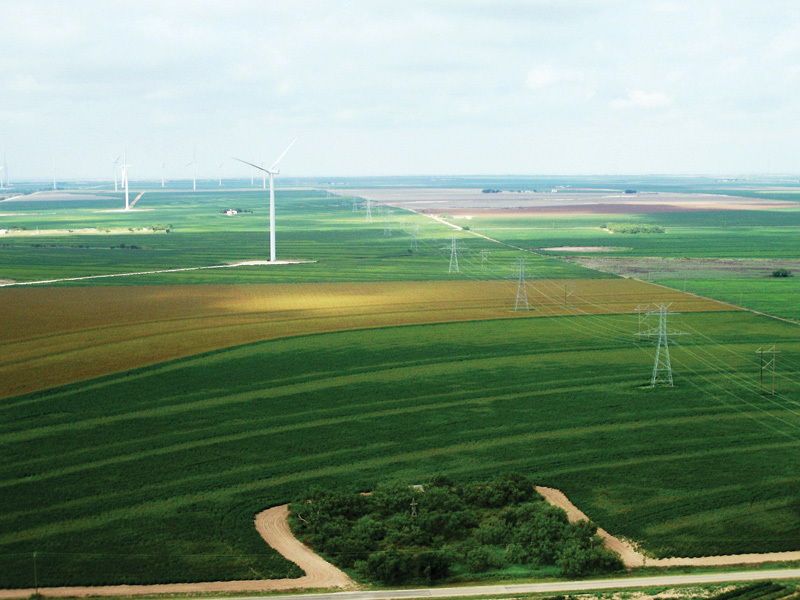 The four phases of the Roscoe/Champion wind farms will be located on a staggering 100,000 acres of land. E.ON Climate and Renewables had to deal with 126 landowners in the first two phases and another 100 landowners in the last two phases of the projects. Scaling the project up meant scaling things up at E.ON Climate and Renewables. "We had to look at our project design and available land very hard once we got the sense that the project could be much larger than we originally thought. "We began the push to redesign everything, to re-focus our efforts. Through that process, we were able to acquire some other turbines. With the access to these extra turbines, we were actually able to move construction up and get the first two projects done in 2007." The first phases of both Roscoe and Champion went on line in March. Labor and materials were not a challenge-at least at that time. "It is certainly a challenge now," says Woodson. "That was around the earlier part of the boom, and right now we are having a much harder time getting equipment and people." Wind power companies are seeing more competition for people from the construction and manufacturing sectors in the state. "And when you have a booming oil and gas industry, you're going to have difficulty finding people with certain skillsets." There were construction challenges along the way. The existing road network helped to move construction along. "But we had about the wettest year weather-wise that we've had in about 30 years in Texas during the first part of construction," says Woodson. "We had 30 rain delays on this project-and this is in an area that usually receives less than 20 inches of rain a year." The first phases of Roscoe and Champion were pretty much done around the same time. Woodson says that as a result, they were able to see some benefits of economies of scale. "We had the same balance-of-plant contractor, D.H. Blattner & Sons Inc., on all four phases of both Roscoe and Champion and we had the same infrastructure. We were able to save some costs and there were savings on mobilization costs." Ideally, the concept might have been to align construction activities so they were finishing an activity on Roscoe and then moving the crews over to do the same things on Champion. "It can work that way," says Woodson. "And there were plans to do more phasing of construction, with crews doing roads on one part and then moving over to do the roads on the second part. We did do some of that, but for the most part we had to have separate and distinct operations. It turned out to be such a massive amount of work." The rain delays were also a big factor. Woodson notes that the construction and operation of the Roscoe/Champion projects have had a very significant impact on the small town of Roscoe. With its location in West Texas, Roscoe had missed out on the oil and gas boom that benefited many other parts of the state. "It's been relying on farming income and it has been more and more difficult to keep a lot of small family farms running over the last few decades. This is a real economic shot in the arm for this area." Woodson adds that there has been interest from people who had to move away from the area to get work in moving back. "It's been real gratifying to have that kind of impact on an area. It's rare that you get a large development like this that works to create an environmentally sound power source for folks, and also helps to revitalize a community. "It's kind of an overwhelming feeling when you see a town that is having difficulties keeping its businesses afloat and then two years later there is now over a billion dollars of investment into the community, with people coming back home and new businesses. We're quite humbled to be associated with that kind of success."